Traveling and eating healthy does not have to be difficult. It can be a challenge, especially if you’re flying and having to navigate all of the airport rules and regulations regarding what can and cannot be taken through security. In this post, I’ll share some of the tricks I’ve used to help me stay on track with my nutrition while traveling. Beef jerky/beef sticks – Epic, Krave, and Chef’s Cut are three of my favorite. Of course, any dry food is always acceptable. Get creative! With your liquids, always try to keep them in a spill-proof container that also has the volume size stamped somewhere on the package. It will create less hassle for you in the long run. If you’re going to be in the car for the long haul a small to medium-sized cooler will be your best friend. You can stock up with any of the foods mentioned above and have meals and snacks ready to go without having to hit a drive through. I like to also bring my own salad dressing, like the vinaigrette dressing used in my Apple Cranberry Spinach Salad. I will mix up a batch of this homemade dressing and store it in a mason jar. Then, if you run out of food options in your cooler, you can always order a salad without dressing and instead use your own! Research your destination online ahead of time and look for Paleo/gluten-free friendly restaurants within your destination area. I search for farm-to-table restaurants using Yelp or other trip review sites. I will also search for gluten-free or organic restaurants. You’ll be surprised at the amount of information you can find ahead of time so there’s no last minute guessing once you arrive. I will also check out local grocers in the area that carry organic, whole foods. My family typically likes to stick with vacation home rentals. I LOVE scouring VRBO for fun vacation rentals! By renting a house you’ll most likely have access to a full kitchen and refrigerator, making it much easier to keep good, wholesome food on hand. I know, I know, who wants to cook on vacation, right? But you don’t have to! Just keep some healthy snacks on hand to keep you from loading up at the local convenience store. I personally don’t mind cooking on vacation, especially if it’s just my husband and I traveling. Of course, there’s always the argument that vacation is all about living it up! I’ve been there, I’ve done it, but for me throwing my nutrition to the wind for a lengthy vacation usually results in me feeling like absolute crud once I get home. Try sticking to the 80/20 rule, 80% on target and 20% splurging. You’ll feel much better at the end of your trip! Want more Wanderlust travel tips? Sign up for our newsletter and follow our Wanderlust journeys! My husband went paleo for a while- I think we are going back to that shortly. This is a great idea not just for travel but for when we’re simply out and about around town. Thank you for sharing! I have a long 24 hr flight coming up this weekend..so these tips are helpful@ thanks for sharing! I live for every and anything wholy Guacamole lol. These are some great ideas will definitely check out that jerry recipe . 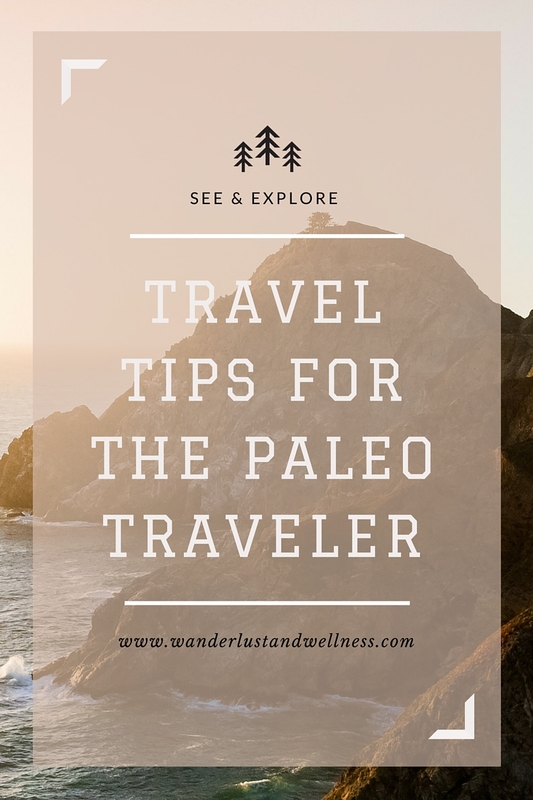 I am not really aware of paleo diet but so agree that we need to be mindful of what we eat so I always carry something from home that I can eat on the flight. Especially given I am a vegetarian, I don’t have to starve because most choices available on the flight are not veg friendly. Such a great post! I often take my own food on board to eat that tastes better and is healthier. I have to be so careful with food anyway with intolerances to gluten and dairy and a lot of additives. Airplane food always gives me a stomach ache so I’m always looking for snack ideas I can take on the plane. Thanks for sharing your list! I’m going to try making homemade jerky before my next flight in January, great idea!